In a certain temple in Miyagi Prefecture is a grave, complete with stupa, in which is interred a chicken. Here is the story, roughly translated from Horobiyuku densetsu kōhi o tazunete 滅び行く伝説口碑を索ねて ("On the trail of vanishing legends and oral traditions") by Tomita Hiroshige 富田広重, which you can read online here. In the cemetery at Seiryō-zan Sōzen-ji temple, located in Negishi, Mogasaki Village, Natori District, Miyagi Prefecture, a chicken is interred. The temple is on the right after one crosses the Hirose river at Miyazawa; fourteen meters inside the main gate, a natural rock half a meter high can be found on the left with "This stupa is not for a human" [卍不之人間之塔] carved on it: this is the chicken's grave. To the right of those words on the rock is carved "The one known as Layman Ryōdō of Igen Hermitage..." [為玄庵了道信士也者]; the rest is illegible. Quick aside: 為玄庵了道信士 is a posthumous Buddhist name, a kaimyō 戒名. Shinji 信士 is sort of like a title; it is of about medium grandiosity, lower than koji 居士 for example. It recognizes the recipient as a righteous non-monastic male. Igen-an 為玄庵 is the angō or "hermitage name". In Japan, it's more common for this slot to be filled with something ending in 院 ("temple", sort of); the use of 庵 "hermitage" indicates a degree of humbleness. Igen is a proper noun and I'm not sure how to best read it; "Plumber of Depths"? "Performer of Mysteries"? It's probably a classical reference I don't get. Ryōdō is the kaimyō proper and roughly means "Awake to the Way", I believe. On the right are carved two lines reading "Erected with respect by Shōji Tarozaemon Kanbun 13 , year of the Yin Water Ox, fourth month, fourteenth day" [寛文十三癸丑四月十四日敬白庄子太郎左衛門], but all we know is that this gravestone was erected 259 years before today, Taishō 15 [1926, and no, the sums don't add up for me either]. The provenance of the chicken-grave is traditionally explained as follows. "Last night your chicken came to me in my dreams. It told me, 'I wanted to repay the abbot for his long years of loving care by warning him of the danger he were in, but birds, sadly, cannot speak, and so I crowed all night instead. But the abbot strangled me and tossed me into the river. I'm caught on a stake at Miyazawa crossing now; please, go in my place to warn the abbot.'" Before he had finished his story, the temple's old cat jumped over the abbot's breakfast tray. The tip of its tail seemed to touch the abbot's soup bowl as it passed, and indeed there was something shiny like oil floating in the soup. Curious, the neighbor investigated the soup more closely and discovered that it contained the terrible poison of the tiger beetle (はんみょう). Realizing that if he had taken his soup without noticing this he would have died, the abbot said, "Cruelly strangling the one who tried to warn me of this peril was a grievous error. I must pray for his departed soul and apologize for my wrong, namu chikushō tonshō bodai namu namu [南無畜生頓生菩提南無々々]." I'm not sure how literally that last bit can be translated, but I understand it as a mumbled prayer for speedy rebirth in human form and enlightenment for animals. Namu is the "Hail to" borrowing from the Indic languages that appears in the famous namu Amida Butsu. Regretting his deeds, the abbot went to Miyazawa crossing, retrieved the chicken's corpse, and buried it within the temple grounds in the chicken's grave we see today. As the grave of a chicken of great loyalty [義鶏], we might expect it to be most effective on those lacking in filial piety and general gratitude, but somewhere along the line it became known as effective against maladies of the eye, and a tradition of hanging wooden plaques with requests for succor written on them [ema] nearby also arose — perhaps because the chicken interred here was killed by a monk blind to what was before him. There are a few pictures of the grave online, like here and here and here, and some of these sites also offer an alternate version of the story where the abbot has the dream and the cat is plotting to kill everyone in the neighboring house. All at breakfast. Truly the Michael Corleone of cats. The Department of East Asian Languages and Literatures and the Council on East Asian Studies at Yale University have put what looks like all the materials from Waka Workshop 2013 online! Readings and discussions at the 2013 workshop focused on Shakkyōka (釈教歌) [Buddhist poems in traditional Japanese 5-7-5-7-7 form] of the Heian and Kamakura periods [...]. We considered the problem of how best to define Shakkyōka—as a form, a sub-genre, a practice?—and how to understand it in relationship to other devotional uta [poetry/song], other Buddhist devotional practices, and to waka in general. I've only read two of the papers so far, but both were well worth the time investment. 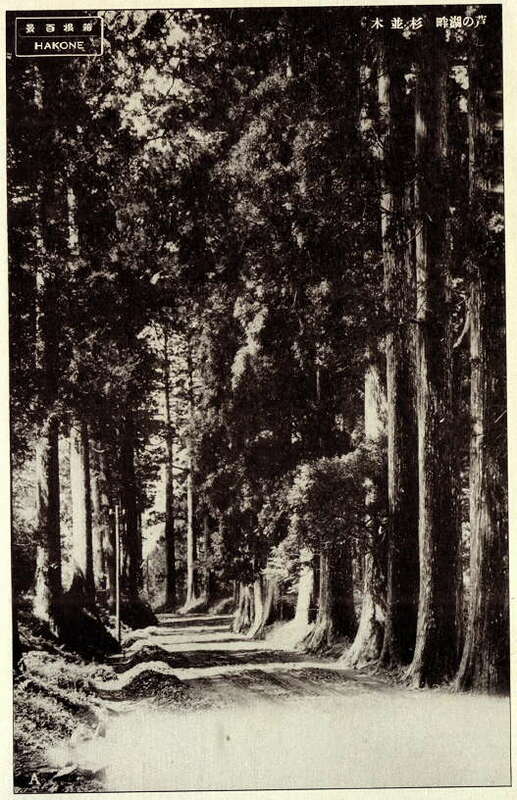 Stephen Miller's "Translating the Path: Principles of Progression in the 'Shakkyōka' Book of the Senzaishū" shows how shakkyōka, too, were placed in careful narrative sequence within the anthologies, just love poems are arranged to trace the arc of a love affair, or seasonal poems put in chronological order from the first stirrings of change in the air to the season's final surrender. The narrative found in the Shūishū sequence is roughly composed of three sections: (1) awakening to and taking refuge in the Buddhist teachings, (2) showing devotion to (or practicing, we might say) those teachings in some way, and (3) realizing the ultimate truth of Buddhism—that is, enlightenment. His attempts to line up the sequences with specific referent structures in Tendai literature/philosophy don't seem entirely successful to me, but I certainly buy the more general argument. There are also essays about Akazome Emon, Imayō, Miyazawa Kenji, and even chronotopic enfoldment. I don't even know what that is, man! This is going to be great. Xacufachi. Certa frauta q̃ ſe tange direito como as noßas frautas. Shakuhachi. A certain flute which is held upright like our flutes. Huh — am I reading that correctly? Does that mean that in Portugal ca 1600 vertical flutes/recorders were still the norm, with transverse flutes considered exotic and foreign? Xamixen. Certa viola de tres cordas. Shamisen. A certain viol with three strings. Note the pronunciation: shamishen. Today, pronouncing the /se/ mora she is considered quaint and rural, but back when the Jesuits were active it was the Eastern pronunciation se that was considered unusual and/or amusing. Coto. Crauo de tanger de Iapão. Vocabulario da Lingoa de Iapam. Nagasaki, 1603. Tokyo: Benseisha 勉誠社, 1978. Is she/are you a "flower-wife", like the soft grass on the peak of Mt Hakone of Ashigara? [No, she is/you are not, but] I shall sleep without undoing my garments [i.e., alone]. What's a "flower-wife"? The standard theory in cases like this is that it is a partner who can only be admired, not touched, perhaps due to some pre-wedding taboo. Incidentally, you may have noticed that the fourth line as recorded has eight morae. People have wondered since at least the Edo period* whether this might not be a scribal error. Simply removing the 都 would reduce the mora count to the expected seven and also change the word from /panatuduma/ to /panaduma/, which is the normal way the word is written. * Ide and Mōri note that this reading is in Tachibana Chikage's ca 1800 Man'yōshū ryakuge 万葉集略解, and Kamo no Mabuchi (1697-1769) cites the poem with the /hanaduma/ spelling in this online edition of Man'yō kō 万葉考. Frellesvig, Bjarke; Horn, Stephen Wright; Russell, Kerri L.; and Sells, Peter. The Oxford Corpus of Old Japanese. 2014. <http://vsarpj.orinst.ox.ac.uk/corpus/>. Ide, Itaru 井手至 and Mōri, Masamori 毛利正守, eds. Shin Kochu Man'yōshū 新校注万葉集. Tokyo: Izumi Shoin, 2008. Jidaibetsu Kokugo Daijiten: Jōdai-hen 時代別国語大辞典 上代編. Tokyo: Sanseido, 1967. In this forum [Okinawa International Forum 2004], we are engaged in a discussion that is based on the results of an excavation study on the historical relationship between Gusuku and Utaki that was conducted by Mr. ASATO Susumu. Of the some 300 places called "Gusuku", there are large sites that are ruins of fortifications. With the exception of Shuri Castle, it is said that, since modern times, most of these sites have been Utaki of a religious nature that are typical of villages. Interpretation of the multilayered relationships of these kinds of ruins and sacred areas is a topic that will likely become significant for the Angkor ruins in Cambodia. Mr. ANG Choulean, who has been researching the religious lives of people who live within these great ruins, discusses the multilayered relationship between the various types of sacred areas and ruins that survive to this day. For example, he mentions the construction of a temple incorporating a giant rock that existed as a sacred place before construction, and today this giant rock, which is reminiscent of a phallus (ringa), has become exposed because the brick structure around it has partially collapsed. [...] This is symbolic of the multilayered relationship between ruins and sacred places. "Oft þæs wag gebad / ræghar ond readfah / rice æfter oþrum..."
The "water of youth" (/wotimidu/) mentioned in last Thursday's post also appears under another name in an essay by Nikolai Nevsky: the incomplete second part of "Tsuki to fushi" 月と不死, collected in the book of the same title. The original is in Japanese; here's an unpolished translation. On August 17, Taisho 15 , while on the steamer from Harimizu Bay [on Miyako-jima] Naha, Okinawa, I recorded the intriguing legend of the Akariyazagama as related by Mr Kiyomura Kōnin 慶世村恒任 of Hirara. Mr Kiyomura heard it from his grandmother. It seems that the original text was in Nevsky's archives, by the way. Anyway, the story starts long ago when people first began to live on Miyako. The Sun and Moon decided to present the human race with a longevity medicine that would allow us to retain the beauty we have at birth forever, so they sent the Akariyazagama with two buckets, one containing the water of youth, and one the water of death. Predictably, things go awry, a snake ends up bathing in our water of youth, and the Akariyazagama decides to let humanity bathe in the water of death because that was all that was left. <sïnimizï> is presumably structurally parallel to Japanese shinimizu, i.e. the verb /sin/ (die) + the noun /mizu/ (water) — although in Japanese the word means "water you give to someone as they are dying," so presumably sïnimizï and shinimizu are not cognate even if their component parts are. Using Hokama Moriyoshi's Japanese translations for Iwanami as a trot, I get something like: "As the Kikoe-ōkimi/chifijin has bestowed the shiji of the Kyō no uchi, let the islands be at peace, let your voice be heard to keep us safe..." Clearly I need to get much more familiar with this material. Hokama, Moriyoshi 外間守善, ed. Omoro Sōshi I おもろさうし 上. Tokyo: Iwanami Shoten, 2000. Lebra, William P. Okinawan Religion . Honolulu: University of Hawaiʻi Press, 1966. Nakahara, Zenchū 仲原善忠 and Hokama, Moriyoshi 外間守善, eds. Kōhon Omoro Sōshi 校本おもろさうし. Tokyo: Kadokawa Shoten, 1965. Nevsky, Nikolai (ed. Oka Masao 岡正雄). Tsuki to Fushi 月と不死. Tokyo: Heibonsha, 1971. Nihon Kokugo Daijiten 日本国語大辞典. Shōgakukan 小学館. JapanKnowledge. Web. The third line of the old version includes the characters 戀水, literally "love-water", here to be read /namita/ "tears." This is found in a large number of manuscripts, including the late Kamakura Nishi-Honganji-bon 西本願寺本. As the NHB is the oldest complete manuscript, its authority has long been respected. 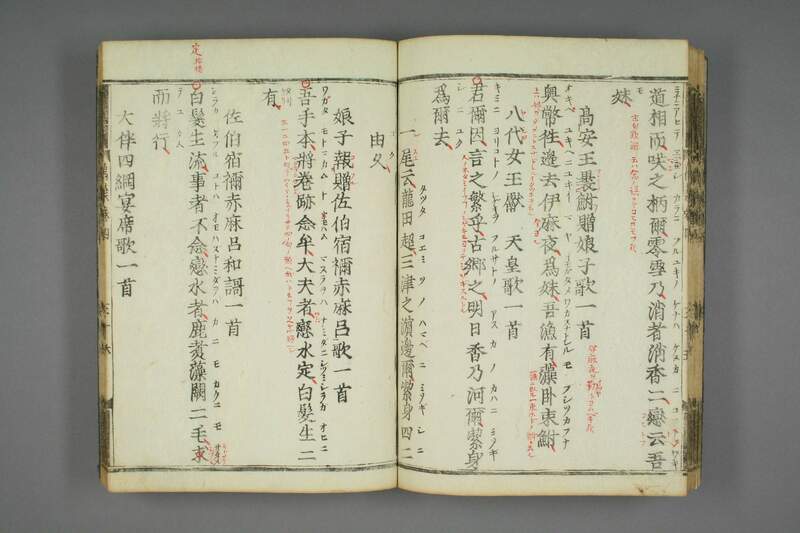 I can't think of a modern edition that doesn't use it as a base text, except for some exceptional cases like John Kupchik's edition of the Eastern Old Japanese corpus, which he based on the Heian Genryaku kōhon 元暦校本 because, he says, it contains "a variety of EOJ features that are not in NHB or later manuscripts" (Kupchik 2011: 910). As it happens, the Genryaku kōhon ("[critical] edition") is key to these two poems too. The GK is dated to 1184 (Genryaku 1, hence the traditional name), and is the third oldest MYS manuscript of all, containing just over half the poems (Vovin 2009: 11). Meanwhile, the character that is variously interpreted as "sink", "seek" (and in other traditions, /sadamu/ "stabilize" — "pacify" for the second poem) is 定 in the old manuscripts, but this was apparently reinterpreted as 求 under a 宀 by Takagi, Gomi and Ōno in their 1957-1962 edition of the MYS (Ide and Mōri 2009: 97; Satake et al 1999: 379), and from there it's easy to get to 求, "seek". Which you want to do, because the second poem has 求 in all manuscripts as far as I can tell. So what? The main thing that interested me about all this is that the original and (let's stipulate) correct reading of these poems seems pretty weak. I mean, look at it: "If you want to be my lover, find the fountain of youth, because your hair is going gray" → "Going gray, you say! I didn't notice! Anyway, I'll get on that fountain of youth thing right away." Where is the conflict, the repartee... the wit? The traditional version may be forced (whoever annotated the 1709 edition linked above used a lot of red ink trying to explicate these two poems) and, okay, incoherent, but if you allow /sadamu/ with a meaning like "soothe" in the second you get a progression that at least seems to be going somewhere: "Sleeping with you will be a vale of tears and make my hair go gray" → "That won't bother me; let me dry those tears." Frellesvig, Bjarke; Horn, Stephen Wright; Russell, Kerri L; and Sells, Peter. The Oxford Corpus of Old Japanese. 2014. <http://vsarpj.orinst.ox.ac.uk/corpus/>. Kupchik, John. "A Grammar of the Eastern Old Japanese Dialects." Diss. University of Hawaiʻi, 2011. Man'yōshū. Seiganji-mae, Kyoto: Yasuda Jūbei 安田十兵衛, 1643. <http://www.wul.waseda.ac.jp/kotenseki/html/bunko30/bunko30_d0001/index.html>. Man'yōshū. Izumoji Izuminojō 出雲寺和泉掾, 1709. <http://www.wul.waseda.ac.jp/kotenseki/html/he04/he04_00090/index.html>. Satake, Akihiro 佐竹昭広; Yamada, Hideo 山田英雄; Kudō, Rikio 工藤力男; Ōtani, Masao 大谷雅夫; and Yamazaki, Yoshiyuki 山崎福之, eds. Shin Nihon Koten Bungaku Taikei 1: Man'yōshū 1 新日本古典文学大系一 万葉集一. Tokyo: Iwanami Shoten, 1999. Vovin, Alexander, ed. and trans. 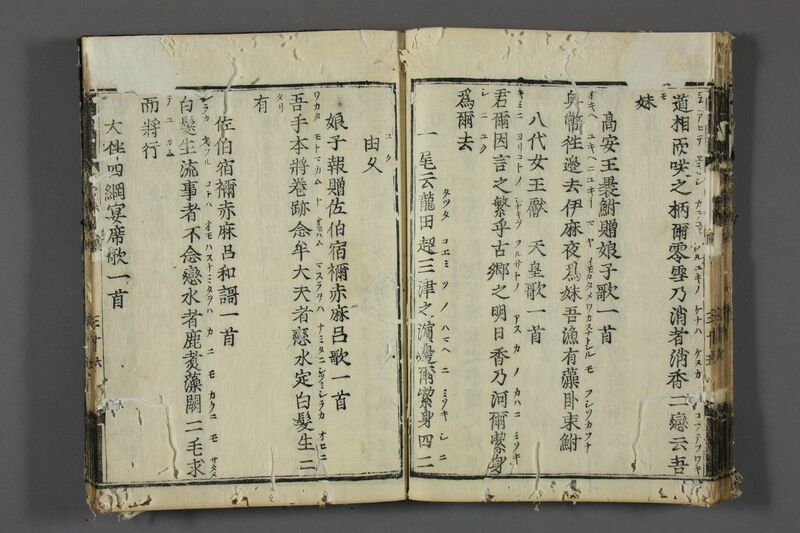 Man'yōshū: Book 15 . Folkestone, Kent: Global Oriental, 2009. Easy to understand written out like this. When leaving two or more young female servants to mind the house, you might say "In any case, they're yoman doshi, kakan doshi." By "Easy to understand," he means that the kanji allow the sentence to be read as something like "equally unable to read, equally unable to write." However, I will confess that his example sentence did not clarify matters for me at all. They can't read or write so they won't pry into personal documents? They can't read or write so they might get in trouble if someone comes calling expecting them to? Then I thought, I think I've seen this word before. And I had! It's in Hino Sukezumi 日野資純 and Saitō Gishichirō 斎藤義七郎's 1965 Dictionary of the Kanagawan Dialect (神奈川方言辞典): ヨマンドシ (Yoman doshi), with the meaning onaidoshi ("the same age"). It's interesting that the dōshi expands and contracts to fit the meter, too. Their second definition was "Children at around the age where schooling begins. Also, someone who has been in the same [school] grade as another since their youth." (就学前後の幼い子ども仲間。また、幼いときからの同期生。) This looks like a humorous metaphorical application: "equally unable to read and write" because not yet able to hold a writing implement properly, and by extension someone who went through that phase at the same time that you did. They also offer three dialectical definitions: "Children of the same age" (from Tokyo), "The same age" (from Kanagawa), "Young, immature" (also from Kanagawa). I wasn't able to find any in-depth treatment of this phrase in particular. But here's what I think happened. First, you have the phrase yoman dōshi, kakan dōshi is coined. It just means "equally unable to read/write." There is variation between dōshi and doshi right from the start, as is very common with words ending in 同士. Some speakers (in Knaagawa, apparently) reanalyze doshi as a voiced form of toshi, "year" or "age" (as seen in words like onaidoshi, "the same age"), giving a word that means "non-reading age, non-writing age," i.e. "young." Meanwhile, possibly influenced by the "young" meaning, other speakers extend the "equally unable to read/write" meaning so that the word can be used to describe people who were unable to read/write (due to youth) at the same time — that is, are the same age, even if they can both read and write now. So I think that Kaburagi's example sentence is supposed to mean "They're the same [young] age, they'll get along fine." But I'm honestly not entirely sure.